Join Us at The Methuen Hotel Corsham where we’ll be exhibiting as part of the Peacock Arts Trail. 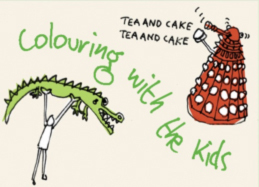 And to celebrate the launch, Susie Brooks will be Colouring with the Kids from 2.00 to 5.00pm on Saturday 3rd October. Help us create a mural to celebrate the second Peacock Arts Trail by adding colour to a crocodile or painting purples on a peacock! Let your imagination run wild.